Questions and Worked Solutions for C34 Edexcel Core Mathematics January 2015. Find an equation of the normal to C at the point P in the form ax + by + c = 0, where a, b and c are integers. Give your answers in radians to 3 decimal places. (a) Sketch the graph with equation y = g(x), showing the coordinates of the points where the graph cuts or meets the axes. (d) Find the range of f. You must make your method clear. (i) Given x = tan24y, 0 < y < π/8, find dy/dx as a function of x. 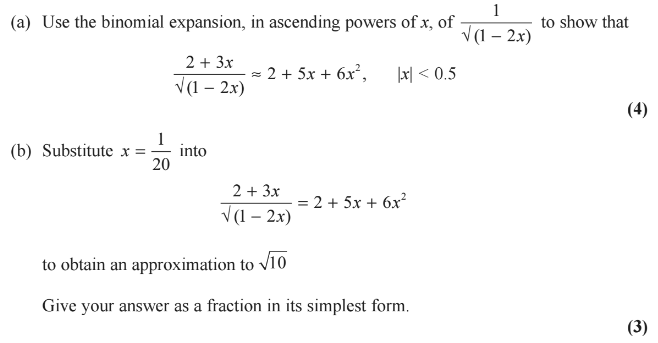 Write your answer in the form 1/A(xp + xq), where A, p and q are constants to be found. (ii) The volume V of a cube is increasing at a constant rate of 2 cm3 s-1. Find the rate at which the length of the edge of the cube is increasing when the volume of the cube is 64 cm3. Give your answers to one decimal place.